A breakout area is a place for your employees to assemble away from their desks or formal meeting rooms. With so many benefits for your business, you really can’t afford to be without a breakout area. Here, we take a look at this essential zone in the modern workplace. We discuss how you can create a space in which your employees will be happy to hang out in. It could even create such an impression, they will to want to talk about it outside the office. We show you how you can choose breakout tables as part of your workplace scheme to achieve an area that inspires imagination and creativity and is a whole lot more stylish than just a last-resort room to use for grabbing a coffee. This part of your office can act as a space to relax and unwind, to wait for colleagues, to meet with visitors, to exchange ideas or feedback, discuss projects, or to work collaboratively away from the main working place. It looks great by breaking up a busy working environment, which is crowded with desks, workstations, ringing phones, computers, or work equipment. Add plants, a living wall, a water feature, or some dynamic wall art to enhance the feel of the area. If it is designed right, your solution will enhance staff wellbeing - and happy employees make more productive workers! They will also remain more loyal to you if they are happy to come to work. The result will be an increase in your bottom line and a decrease in recruitment and training costs. 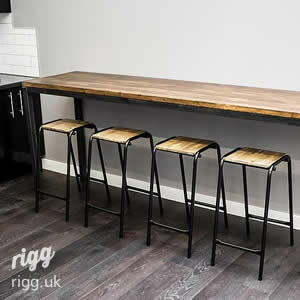 Rigg Furniture uses a variety of materials in our tables, including traditional wood, plywood, laminate, steel, brass, copper, zinc, glass and linoleum. The result is a range of contemporary, industrial-style tables that bring an avant-garde edge to your office. We have different heights, sizes, and styles to suit whatever purpose you choose. We can incorporate cable management features for electrical connections into your chosen design, so staff can plug in or charge their device and get to work. Most of our designs are available with a zinc top. The beauty of zinc is that it develops character with age and the rich, grey tones combine industrial with a welcoming feel. We combine handcrafted oak with metal and use the most robust materials for strength and durability. All of our tables are manufactured in-house with superior craftsmanship. We have different sizes available, whether you want a table for an alcove or a large desk for multiple seating. Why not choose a table with steel hairpin legs? - they look elegant and a little bit quirky, but are surprisingly sturdy. 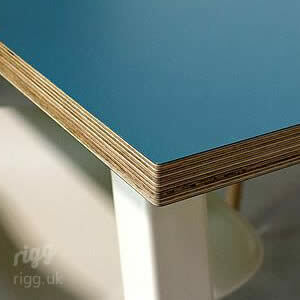 Rigg’s Round Resin Top Table with Hairpin Legs is perfect for eating and drinking. You can choose from a variety of colours, including punchy tones for a bright, stimulating area, and you can have your company logo machined into the table-top before we apply the epoxy or resin. This is great for brand visibility. We can make larger versions and lower heights for occasional or coffee tables, so you have a mixture of different size tables for different purposes in your breakout area. Plenty of care and consideration has gone into the minimal, uncluttered design of our Quad Table. Key to the design is the placement of the legs, right in the corners of the table for maximum space for the chairs underneath. The legs are made from 50 mm square steel tube to ensure they are extremely sturdy and robust. The frame is of welded and bolted construction. The birch plywood laminate table-top is available in a wide variety of colours, such as a vibrant orange to stimulate the mind and encourage creative thinking. The Loop Desk is perfect for tough working environments and has been designed to cope with uneven floors. It has a hard-wearing powder coated frame and a birch plywood top, generously coated in a high-quality matte lacquer for both durability and style. Stance Zinc Office Table has sturdy legs for durability and is perfect for workspaces and hospitality environments. The Grafik Desk uses authentic materials to create a desk that combines contemporary design and industrial chic. The Zinc Top Desk with Hairpin Legs is the perfect blend of modern and traditional. The outer rim of the desk is made from handcrafted oak and the steel legs are sturdy yet delicately proportioned. Copper Top Desk: Whether you choose an aged finish or simply buffed, our Copper Top Desk is a beautifully rich and warm addition to your office. Linoleum High Table: a contemporary breakfast bar with bar stools for side-by-side working. Quad Industrial Table and Benches give a rustic, outdoor-with-nature, picnic bench feel. Teamed with plants, greenery, brickwork, wood, and modern art, industrial style desks make an office modern and contemporary. They represent strength, durability, power and organisation. From art galleries to architects, to accountants to workshops, we can provide the perfect table for your approach. Guides to buying furniture for office, education, hospitality and domestic applications.